At a recent courtroom hearing in Denver, a woman was experiencing secondary trauma as the triggering details of a court case were being discussed before a judge. But she had help by her side in the form of a canine companion. 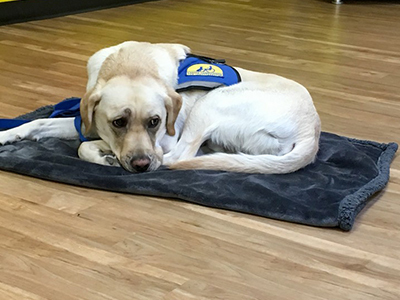 “Rylan,” a two-year-old Labrador/golden retriever mix that has been acquired by the Denver District Attorney's Office to work with victims, identified the woman out of everyone else in the courtroom as someone who needed his comfort. The woman later said she felt significantly calmed and reassured by the dog's presence. At a press conference announcing Rylan's “hire” with the office today, December 27, Kramer said that the recent courtroom episode is exactly why the office obtained the pooch. Rylan does not come at any taxpayer expense, McCann adds. The highly trained dog, which is worth about $50,000, was provided for free by the nonprofit organization Canine Companions for Independence. But obtaining Rylan has been a long process. McCann said that when she was elected as district attorney, she already knew that other DAs use canines to help victims of violent or sexual crimes (Arapahoe County and Boulder County have service dogs, for instance), and McCann applied for a dog through Canine Companions for Independence roughly a year and a half ago. The review process involved selecting a handler with whom a dog would both work around the courthouse and live with. Senior Deputy DA Jason Kramer volunteered to shelter a dog; he had to go through multiple interviews, two weeks of training in which he learned more than forty commands that Rylan had already mastered, and grooming and feeding regimens before Rylan was given to him and the DA's office. Kramer is responsible for feeding and transporting Rylan to and from work.